Pease pudding is a traditional British recipe hailing from northeast England and is not a pudding in the dessert sense of the word. It is a savory dish and is served with cooked meats usually boiled ham or gammon. 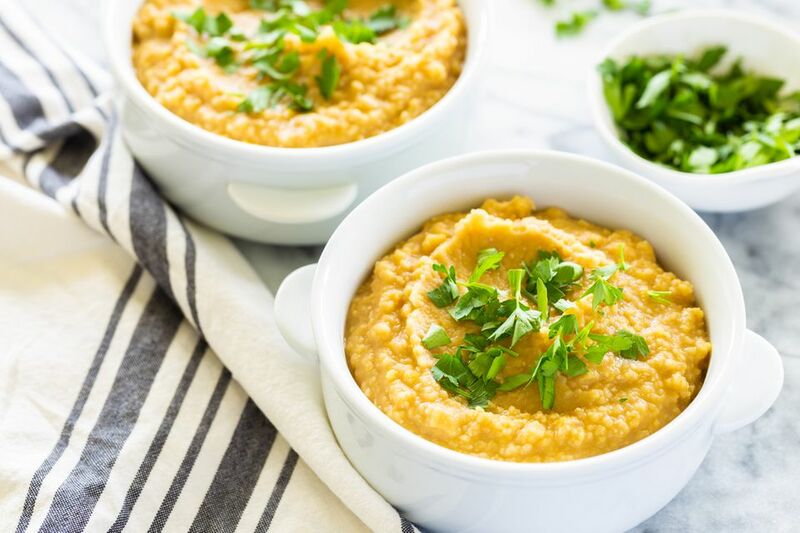 A pease pudding is made from cooking yellow split peas to create a lovely soft paste-like consistency and cold, leftover pease pudding can also be fried. The dish is not unlike the famous mushy peas, also much loved in the North and made with dried marrowfat peas - though you would never fry mushy peas, they are too soft and do not hold their shape. In case you are in any doubt about the popularity of Pease Pudding, the traditional dish even has its own nursery rhyme. Pease pudding is also known locally as pease pottage or pease porridge. The pudding is most often served with cooked ham or gammon and the lovely recipe below comes from celebrity chef Gordon Ramsay's recipe from his recipe for Gammon with Pease Pudding and Parsley Sauce. For the pease pudding, drain the soaked yellow peas and tip into a saucepan. Add the onion, carrot, bay leaves, and cover with cold water. (If you are cooking ham as well, add some cooking stock, but taste it first to make sure it's not too salty). Bring the peas to the boil. Once boiling, lower the heat and simmer gently for an hour or until the peas are tender. Occasionally skim off any scum that rises to the surface. Blitz to a thick puree, but do not over mix as the peas do not need to be smooth. Pour the peas into a clean pan. Add the malt vinegar and season to taste with salt and pepper. Gradually beat in the butter a cube at a time. Keep the pease pudding warm until ready to serve. The pudding will thicken as it cools and thins again when hot. If the pudding becomes dry, add boiling water a little at a time, taking care to not make the pease too thin. Serve with a thick slice of cooked ham or a gammon steak and ​parsley sauce. The pudding will keep covered in the fridge for a few days and freezes well.